Outback meals are us! Come and have a real feed with Lyall and his friendly staff at the Oasis Café and Bistro. Breakfast or lunch. Our new dining area has plenty of seating and we can easily accommodate the largest bus group. We have a great menu on offer with all your favourites including roasts, lamb shanks, and steaks always on the menu, we also have fish and a variety of other meals on offer to suit most palettes and dietary requirements. You can also choose from our take-away menu or try one of Lyall’s famous home made pasties or pies. We can also do delicious sandwiches made to order with our own fresh bread and rolls. The freshest bread north of Port Augusta, baked on site in our bakery every day. We also have an espresso machine for a great cappuccino and generally have lots of nice sweet things on offer too. Choose from cakes, muffins or some of our yummy home made biscuits. 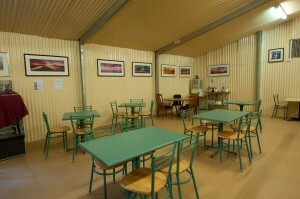 So if you’re after a great coffee in the outback, come and see us. Take a seat and enjoy the award winning photography by Julie Fletcher. For the wine lover we also carry a great selection of red and white wine varieties as well as pre mix cans, beers and spirits. Our general store stocks a large variety of fresh fruit and vegetables as well as pantry staples, toiletries, laundry and hardware items.